MYRTLE BEACH, S.C. (June 28, 2018) – Myrtle Beach, known for its 60 miles of beautiful coastline, and endless entertainment, activities and attractions, has been recognized by TripAdvisor as one of its 2018 “Most Excellent” global tourism destinations. This honor is just the latest in a series of achievements recognizing the Myrtle Beach area for its stunning beaches, family-friendliness, affordability and wide variety of attractions and adventures. TripAdvisor assigned several Certificates of Excellence to the Myrtle Beach area for providing excellent service and consistently earning high traveler reviews on TripAdvisor. TripAdvisor recognized the destination specifically as one of the top ten cities for travel experiences. Myrtle Beach was one of only seven U.S. cities overall to be honored as a Most Excellent destination. The Most Excellent designation is just one of the many accolades the Myrtle Beach area has received in 2018. It was also named one of the top beaches in the U.S. by Travel Channel, USA Today and TravelPulse. Outlets such as TripAdvisor, Expedia and U.S. News & World Report have named Myrtle Beach a top destination for escaping the cold and for family summer vacations. Coastal Living recognized Myrtle Beach as one of the most affordable beach vacations in the U.S., Resonance Consultancy named it one of America’s best small cities, and both Where to Retire and U.S. News & World Report called Myrtle Beach one of the top places to retire and move to, respectively. The Myrtle Beach area continues to be recognized for its hospitality, affordability, numerous attractions, and as a top family destination. For more details on planning your Myrtle Beach getaway, go to www.VisitMyrtleBeach.com. Click here or on the image below to download the image. Stretching from Little River to Pawleys Island and comprising 14 distinct communities, the Myrtle Beach area is home to 60 miles of sandy beaches, an assortment of entertainment and family attractions and world-class golf. 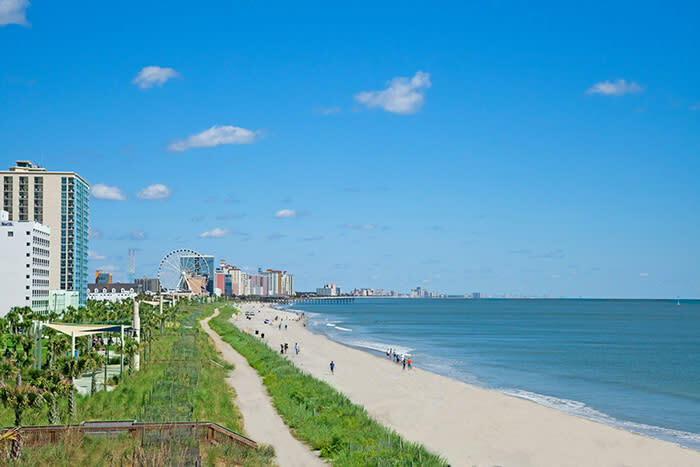 Popularly known as the Grand Strand, the Myrtle Beach area presents the quintessential vacation experience peppered with plenty of Southern hospitality. For additional information on the Myrtle Beach area, visit www.visitmyrtlebeach.com or call (888) Myrtle-1.